Hellboy is a comic that was turned into a movie, it was about a small boy demon that was taken in by the good guys and trained well so he can help them catch monsters and demons when he grows up. The character was quite popular that Microgaming has decided to adopt it and create a video slot machine that is themed around that character, this is why the slot machine is conveniently named Hellboy. 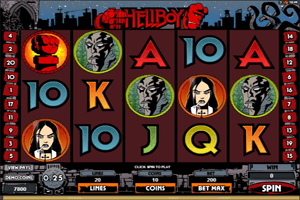 Hellboy video slot machine has a format of 20 lines and 5 reels on which the symbols spin. These symbols are all inspired by the movie and its characters. This is why they include Hell Boy himself, the logo of the game, Hellboy’s red fist, the professor and much more. These symbols can pay players through line payouts and through the special features that some of these symbols has. For example, there is the high paying Underworld Bonus round. This round is activated when players get a minimum of three Hellboy’s red fist symbols scattered anywhere on the reels. Players will go on a mission in order to locate and secure the relic of power. The logo of the game is the wild icon of the Hellboy slot machine and it will replace any other symbols, except the bonus and scatter symbol to form a payable combo of symbols.